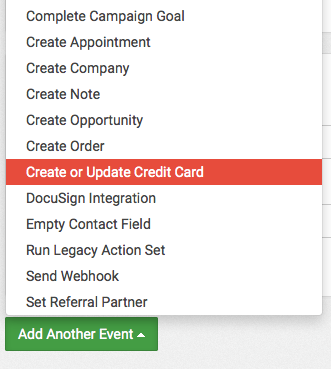 Click the Add Another Event button and select Create or Update Credit Card. Now match your Infusionsoft Credit Card fields to the extracted Credit Card fields you created from your Email or Webhook. If you only accept one type of card, you can Manually set the value like in the example below. To assign the name of the card click on Advance Field Options and use the Custom Value Fields to assign the name. Note: Make sure you are using your exact Merge Fields by clicking the blue Merge Fields button and copy/pasting yours in the box. Keep in mind, this event can only be ran once for each real credit card because Parsey removes the Credit Card Number from it's database as soon as the event is Processed. Note: If the last four digits of the extracted Credit Card Number match the last four digits on a Credit Card that is already on the contact record, the Credit Card will be updated and it will not add a new Credit Card. You can now successfully create or update a credit card on the contact record.